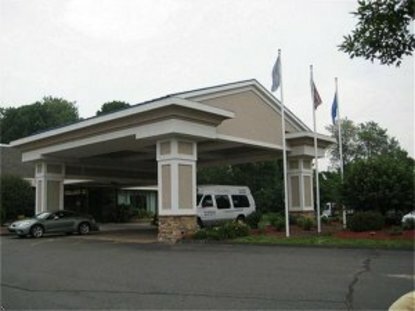 Located in the heart of New England, the Holiday Inn Express - East Windsor is a short drive from Bradley International Airport or Six Flags New England.The hotel has recently enhanced all of its guestrooms. All freshly renovated guest rooms features stylish urban boutique interior furnishings complemented by newly textured graceful walls elegant carpet, and all new Simmons BeautyRest Mattresses in every room.On-the-go business professionals can relax in our featured ergonomic chairs and enjoy our free high speed Internet access. Holiday Inn Express at East Windsor is the ideal choice hotel if you are traveling for work or pleasure.Start your day with our free Continental breakfast buffet, which includes our famous cinnamon rolls along with fresh bagels and pastries. We also have a variety of health conscious, low-carb selections.Be sure to check out our business center, fitness center, or one of our two spacious and recently renovated meeting room facilities.The hotel is easily accessible to Windsor Locks, Windsor, Enfield, Suffield, East Hartford, and even Springfield, MA. Our two complimentary hotel shuttle vans can be used for transportation through out the local area as well as Bradley International Airport. Make us your "one-stop" destination for work or play This hotel is committed to providing accessible facilities under the American Disabilities Act. If your accessibility needs are not met, please contact the Hotel Manager on Duty. Should you require additional information regarding accessible facilities for guests with disabilities, please call 1-800-Holiday (U.S. and Canada) or contact the hotel directly. For the hearing impaired, TDD service is available at 1-800-238-5544 within the U.S. and Canada.